As a developer at Data Springs, you can imagine how many different software components we try out for our Development needs when creating solutions for clients. About 2 years ago I have found a Holy Grail development tool called OpenWebStudio(OWS). The more I work with this tool, the more I respect and invest into this development tool. For me it seems that there are endless possibilities with this module. I haven’t been let down yet. 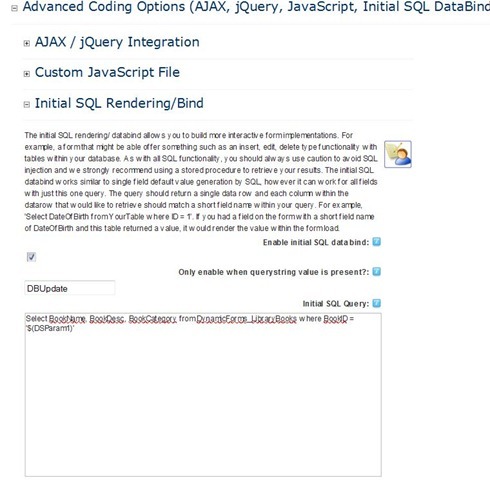 This blog post is a tutorial to getting started in OWS and integrating it with Dynamic Forms 4.0. * Have an installation of DotNetNuke 5 or above. * Purchase Dynamic Forms or use a Dynamic Forms Trial version. * Install OpenWebStudio and Dynamic Forms onto your DotNetNuke installation. * Create 1 page, this page will contain a Dynamic Forms module instance and an OpenWebStudio module instance. 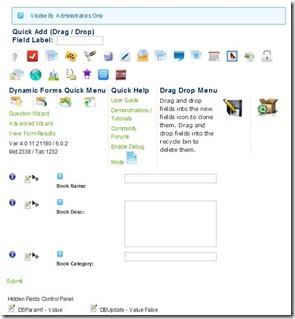 * We need to build a form using Dynamic Forms to insert and update Books from flat table. This is going to end up being an Admin control. 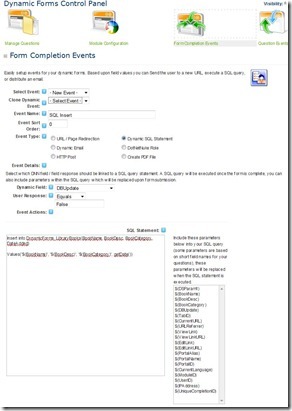 You will need to go to Host-> SQL and create this table. Now that you have created this table, we can get started with the first part. 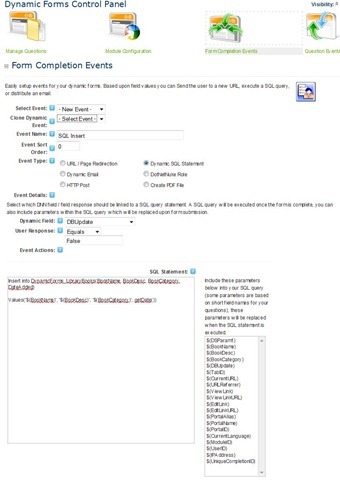 Now we must create a SQL Form Completion Event that will insert into the SQL Flat Table that we have created. Go to Form Completion Events and add a new Form Completion Event as the type Dynamic SQL Statement. This Completion Event must fire conditionally based on the value of the DBUpdate field. In order for this Form Completion to Execute we will only fire this event when DBUpdate = False. Now we need to build the insert statement. The insert statement will look very similar to the following script. The image below depicts the settings and such that the Dynamic SQL Statement should contain. 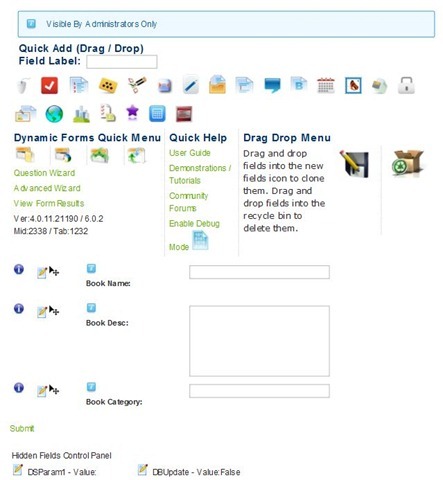 Now you can insert into the DynamicForms_LibraryBooks flat table when you fill out and submit the form. So this Dynamic Form has now achieved an Insert mode for entering records into our table. Update Settings after configuring these settings for Initial SQL Binding. Now we will need to create another SQL Form Completion Event to account for the Update Mode of the Dynamic Form. 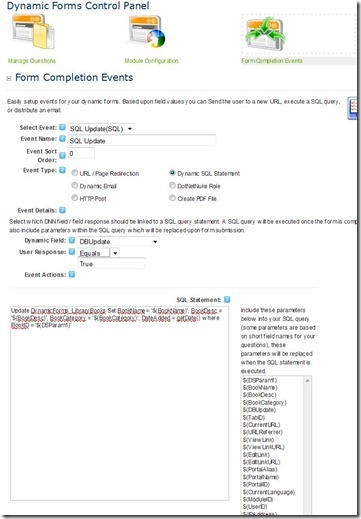 Go to Form Completion Events and add a Dynamic SQL Statement event. This event will need to Execute when DBUpdate = True. Now our Insert and Update Mode are completed, the next part will be to get an OWS grid to integrate with the work that we have achieved so far. This concludes part 1 of 3 in this Tutorial. Tutorial Part 2 will be published by Feb 21, 2012. If you have any questions please leave a comment. Also please let me know if you’re interested in a particular example.